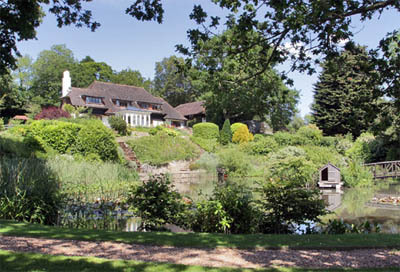 Dixgate is an attractive 1920s period house located near Benenden in Kent with extensive period features typical of the period, including wooden wall paneling and polished quarry tiled sills. Principal reception rooms face south with very good views; the drawing room has a brick fireplace with a wood burning stove and a formal dining room offers double doors out to the orangery. The kitchen is spacious and well-equipped, and the first floor has four bedrooms (one en-suite). The landscaped gardens are a great feature of the house with a pond and substantial stone and brick-paved terraces spanning the length of the house. Lawns with colourful borders are flanked by mature trees. Outbuildings comprise the garage and adjoining gym with hot tub, garden store and a greenhouse. Dixgate is located in Benenden in Kent, which has a village shop, post office and butcher with more extensive shopping in Cranbrook. The guide price is £1.175m. For further information please contact Savills on 01580 720 161 or visit their website.